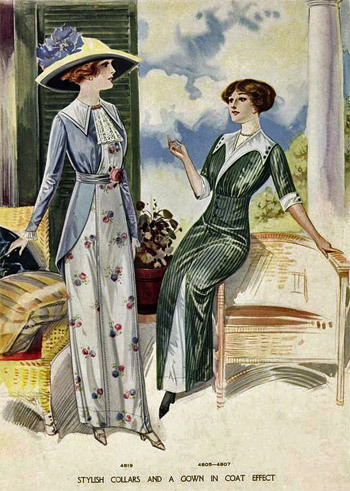 When deciding what to wear to the “Titanic exhibithion” I looked through a lot of pictures and patterns from the 1910-1912 period. Then I found this one. 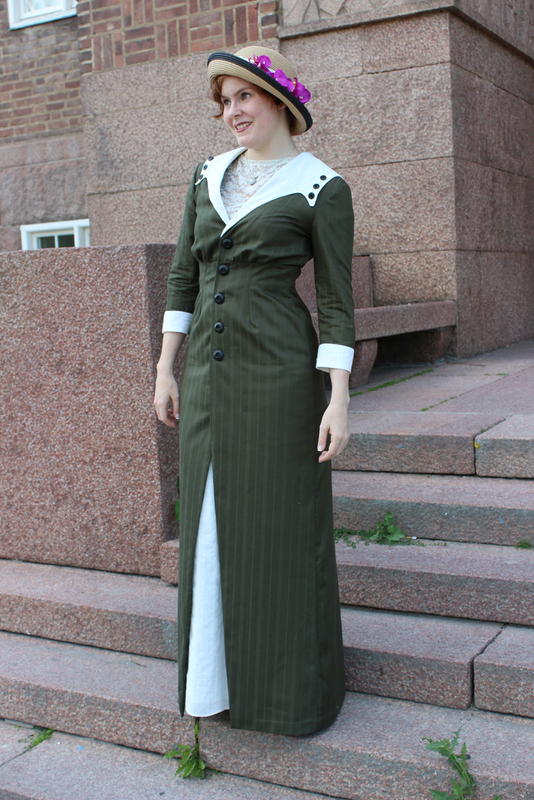 The dress has a bit more of a 1913 style to it, but nothing to apparent. 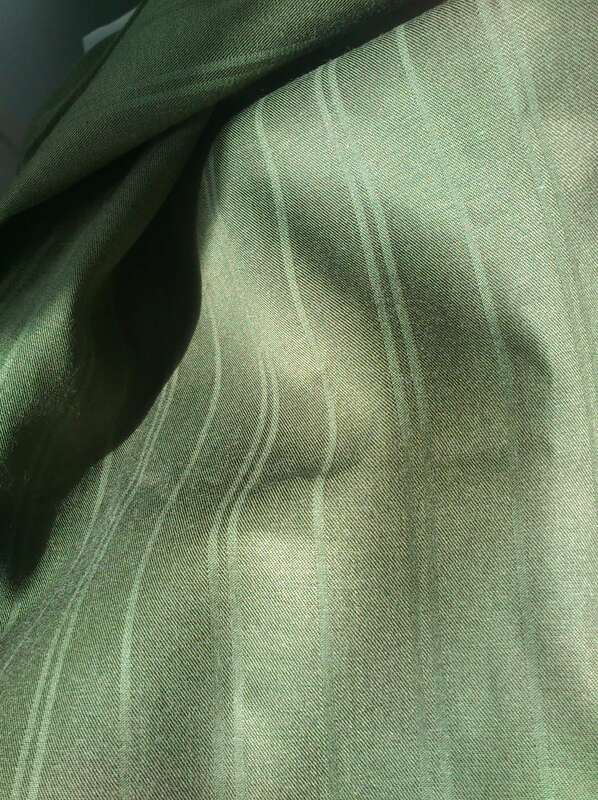 The fabric for the dress is a green striped wool that’s been in my stash for a couple of years. The only thing that needed to be bought was the buttons, so it was a pretty cheap project. Even though buttons can be terribly expensive, and more often than not you will need a lot of them. I drafted the pattern myself, using Waughs “Cut of Wlomens Clothes” as a guide to the general shape. It wasn’t until I already begun sewing that I realised two things. 1. 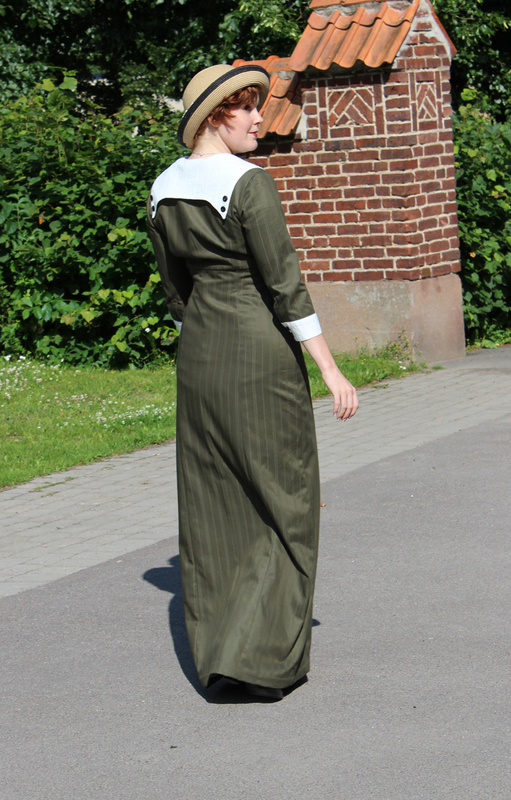 This dress would fit perfectly to the HSF challege 1. – ..13 (make anything from the year ..13) which is the only challenge so far that I missed out on. To my defense I didn’t know about the HSF until the second challenge had already started. Better late then never right. 2. 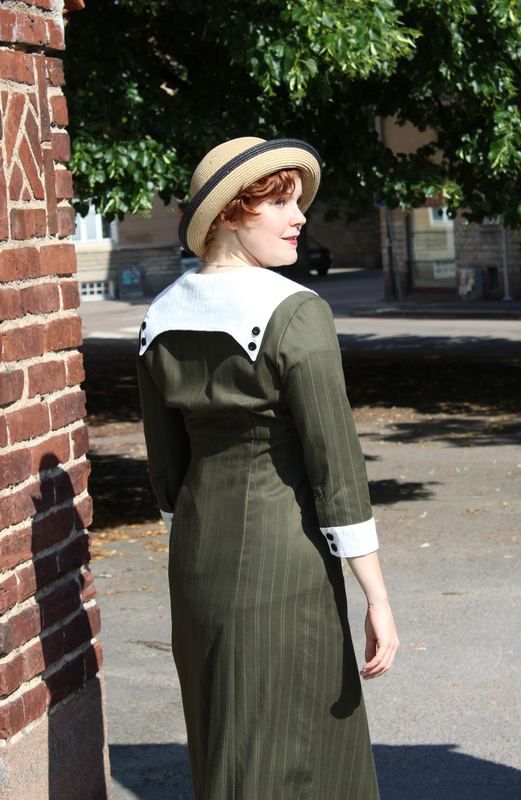 This dress was beginning to look a bit too much as my “By the sea” 30s dress. 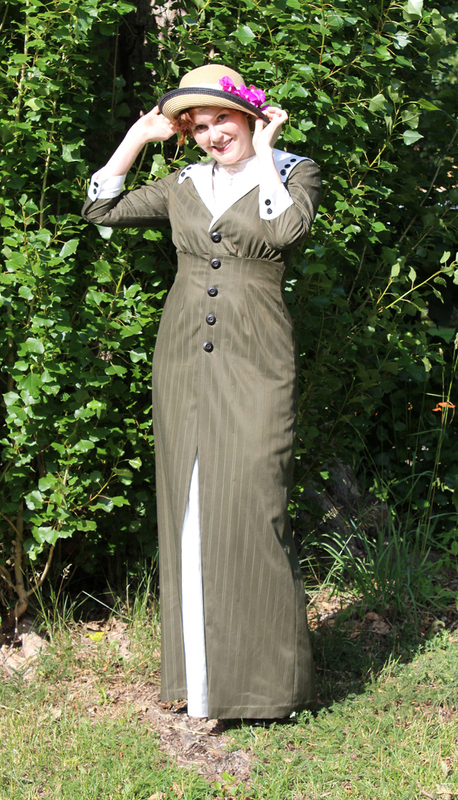 The silhouette, the color combination with the big white details, I even used the same fabric for the collars. 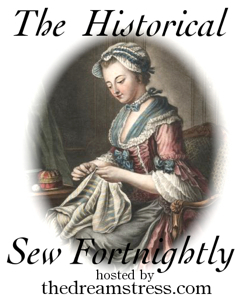 Well, all the fabric was already cut – there was no use not to continue. 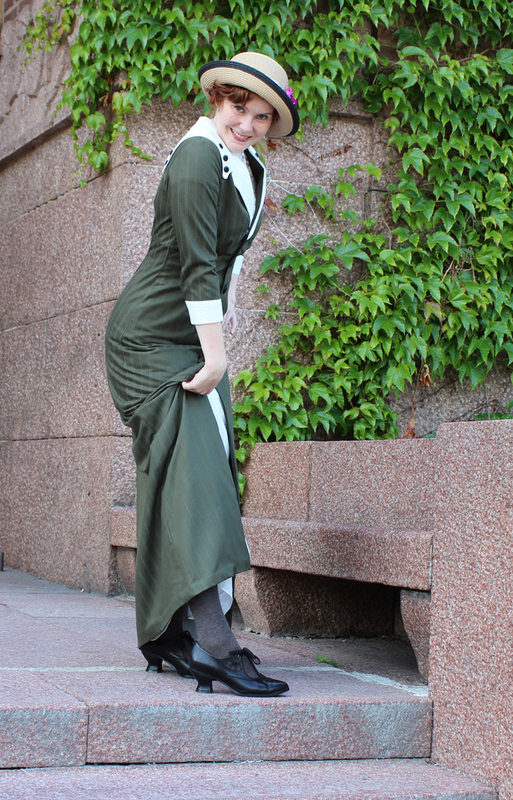 And besides, I really did like that 30s dress. 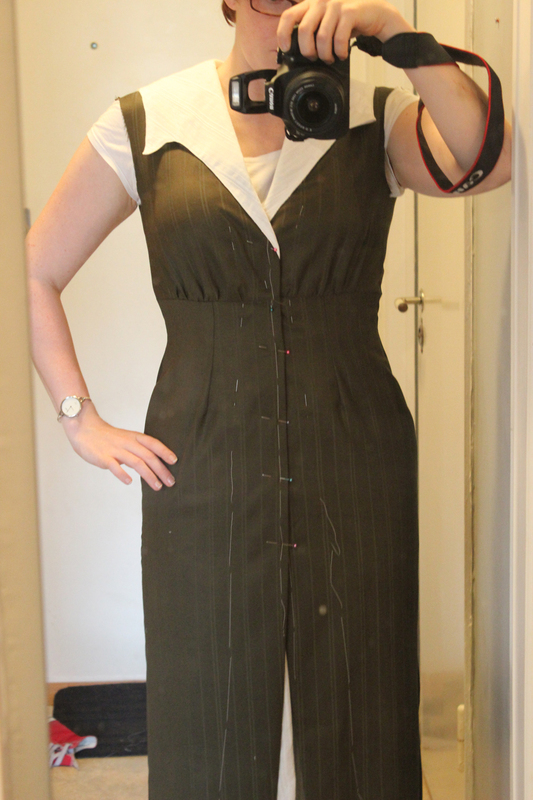 Getting the dress together went fast but I did have to reshape the collar a bit smaller – something I discovered after I had sewn it on. 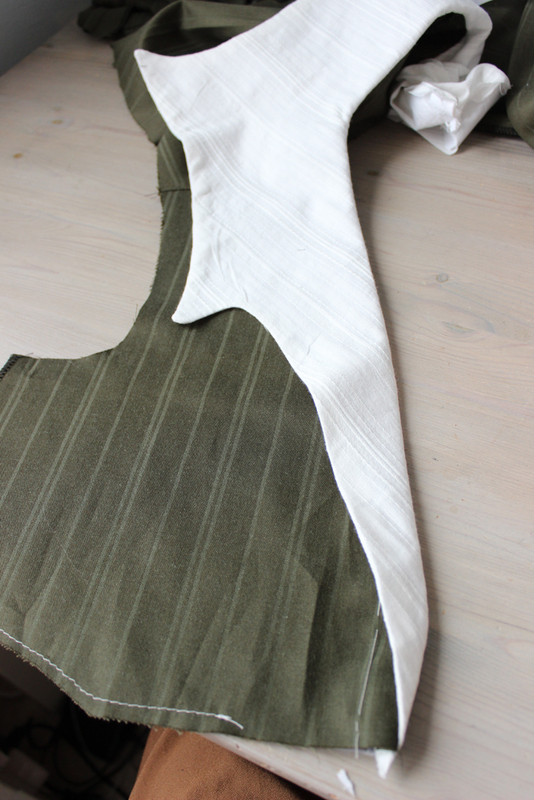 So I unpicked the seam and re-cut the front tabs to end a bit higher in the neck opening, and then sewed it back on. And then I tryed it on. For the opening in the front of the dress I decided to make a separate skirt in the same white voile that I used for the collar and cufs. So I re-used the skirt pattern for the dress and cut a high waisted slim skirt. 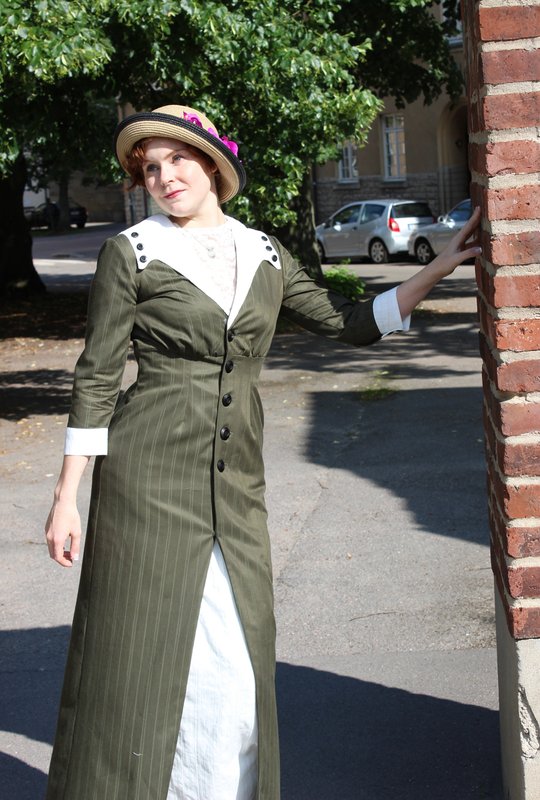 So here it is, my contribution to the HSF Challenge 1 – A 1913 dress – I’m only one year late for the Titanic. 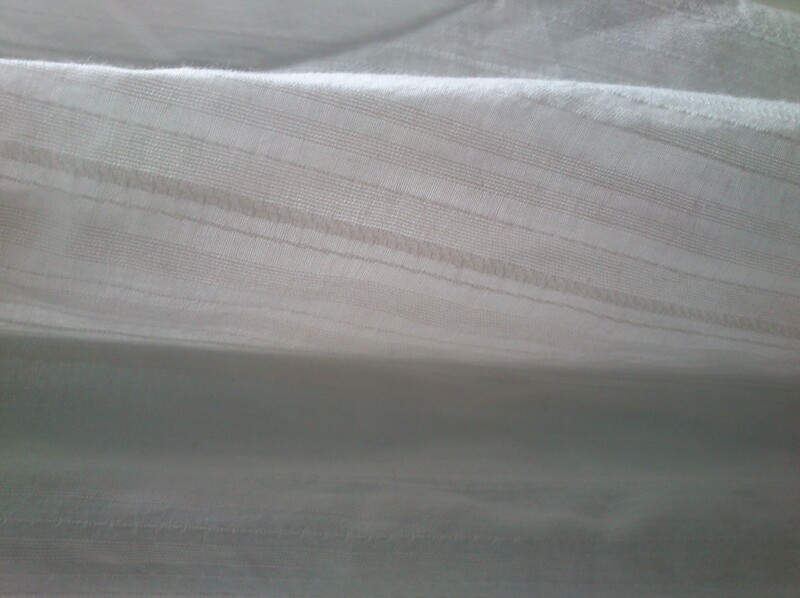 Fabric: 2,5 m of green wool, and 2 m of white cotton voile. 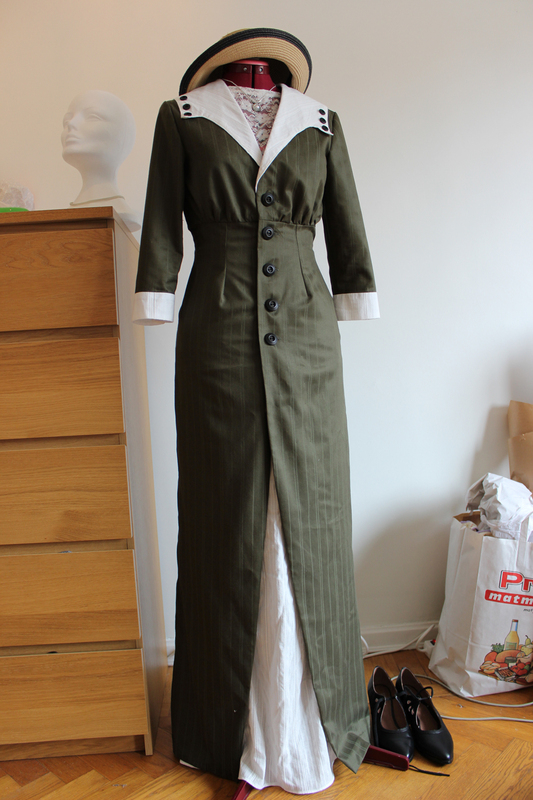 Pattern: I drafted my own, based on Waugh’s “Cut of Womens Clothes”. 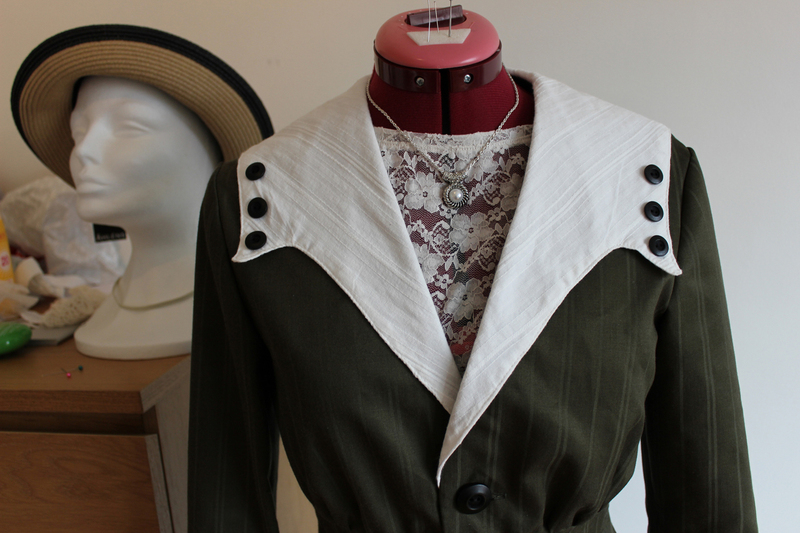 Notion: Thread, interlining, buttons (5 big and 14 small ones) and snaps. 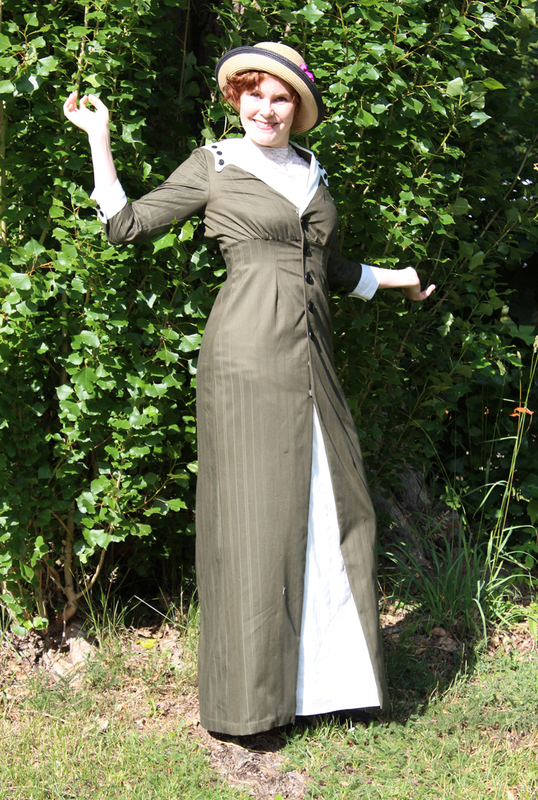 Historical accuracy: I used modern sewing and drafting techniques, but the fabric and the over all look of the garmnent are about right. Cost: 200 SEK total (half the amount now, and the rest for stash fabric). 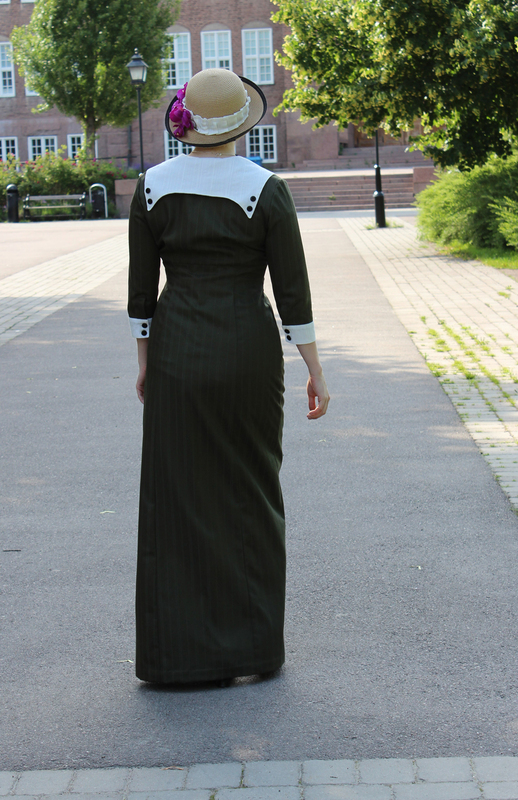 First worn: On the Titanic exhibition on the 6th of July, and the following photoshoot. Jag *älskar* den här klänningen! Helt perfekt på alla sätt. I LOVE this! LOVE LOVE LOVE! 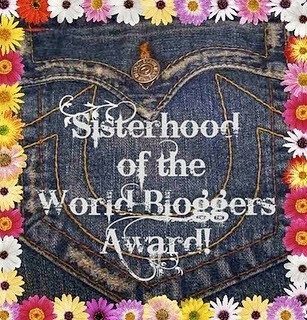 Oh, Thank you so much ladys! It’s my firs costume that I actually got to wear. Lovely posts. 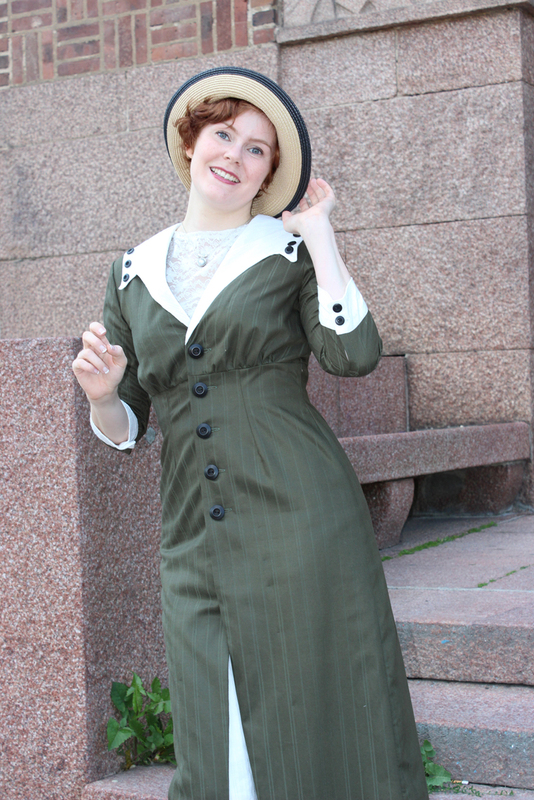 Do you happen to have anything about the 1940″s? I’m absolutely in love with this.! 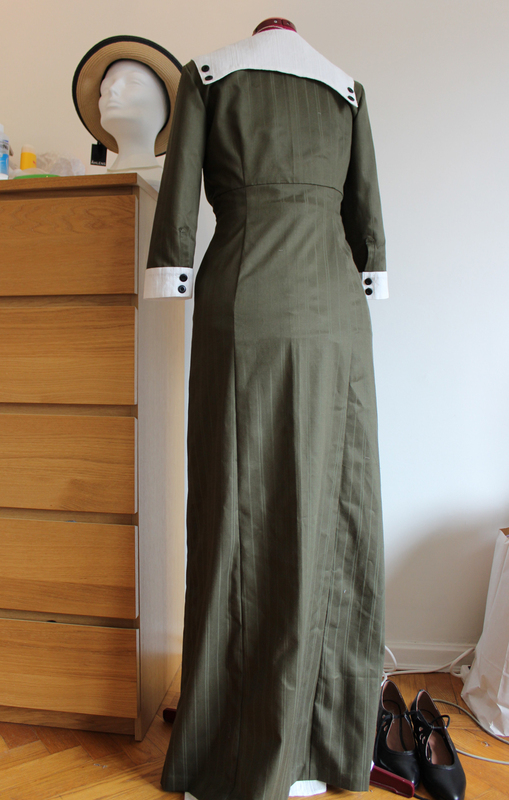 I have several green dresses on the table (oops, still in the concept stage) so I didn’t want this one to be green too. 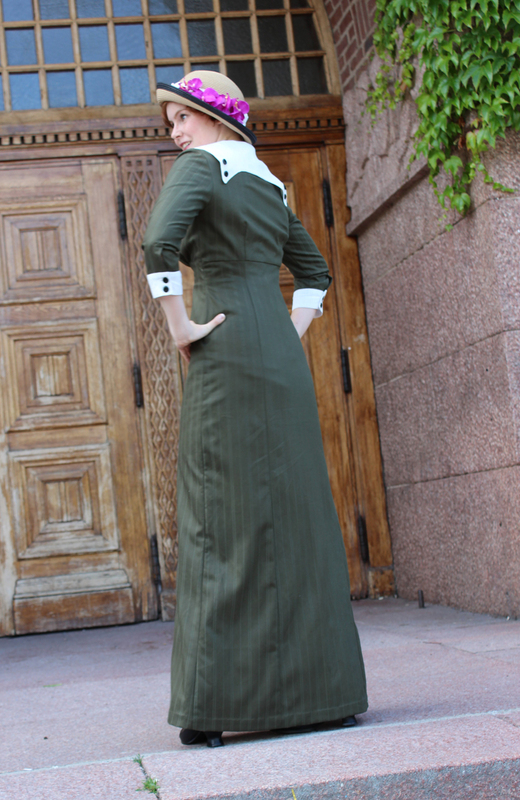 (Although yours is marvelous in green.) I decided on a merlot color, and went to my local fabric store on the lookout for some fabric in that color range. It was one of those “pull togethers” that made me nervous that I was overlooking something. I found the perfect shade of merlot (97 % cotton) and a linen/rayon remnant for the collar. 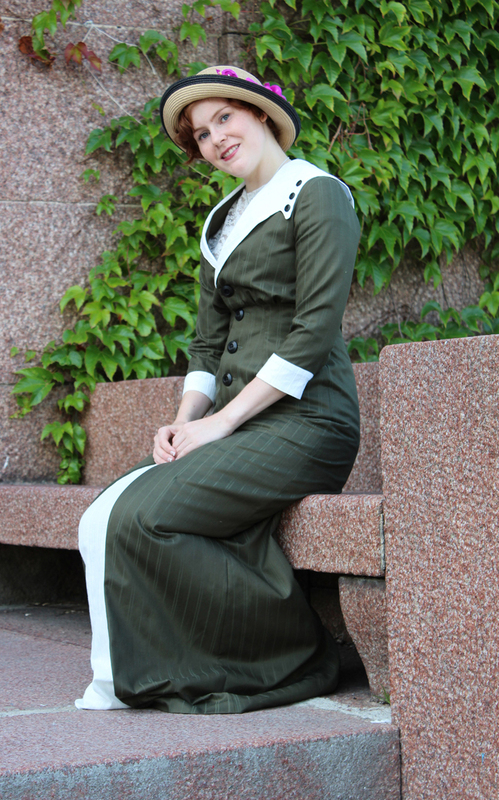 (I didn’t know you used the same collar fabric for the under skirt) I found detailed buttons that match perfectly for the dress front and a package of flat buttons to cover with fabric (maybe embroider a design on them ) for the collar and cuffs. I even got silk thread to match. 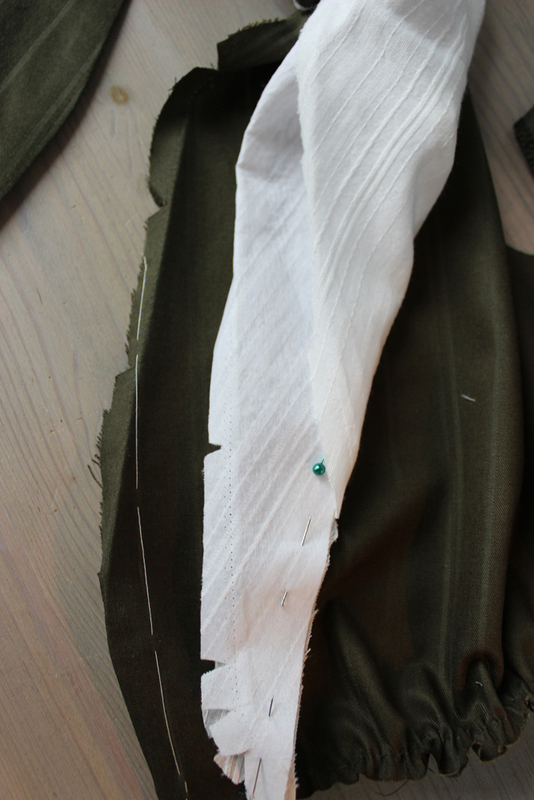 The hitch is a hand injury that made it impossible to sew for at least another month during healing process. I’m loosing my mind with all the perfect ingredients for this luscious dress just waiting tantalizingly close, but can’t work on it.) 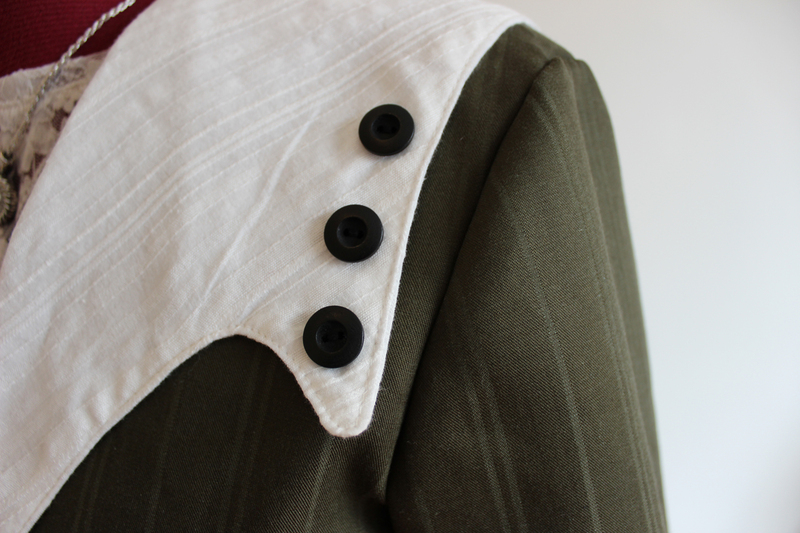 The only part I am reallly stressing about is fabric covering flat buttons (regular buttons, not the shell and shank with back piece that fits in the shell.) You inspire me. 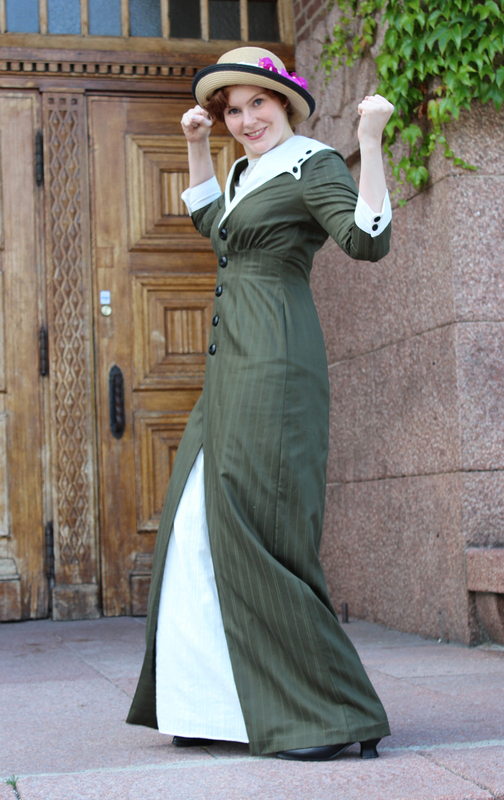 Love this dress, and love your fun photos.